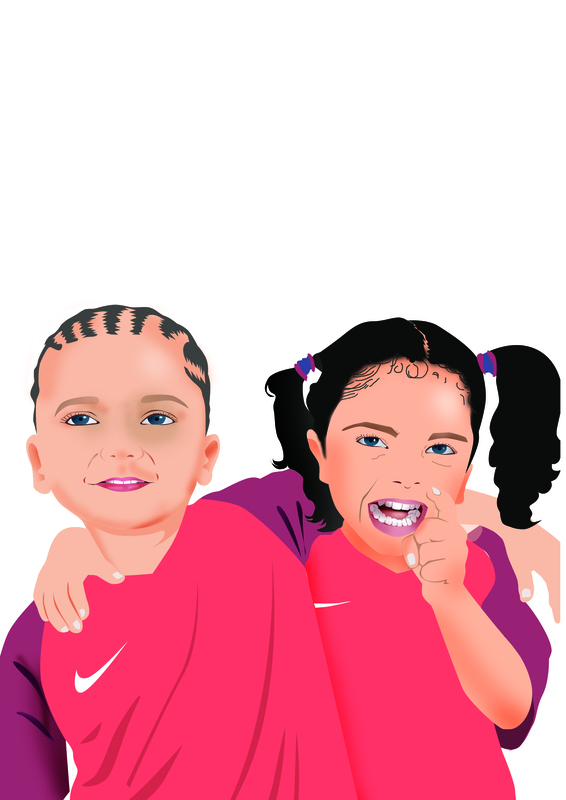 To create a portrait, an illustrator can begin with a photo or start from the scratch without using any reference image. There are a variety of illustration styles, techniques and media that can be used by the artist depending on the result required. Every illustrator has his own preference when it comes to the tools for portrait illustration. Paper-pencil, paints, collage or even illustration software like Photoshop or Illustrator. Whether it is traditional portrait illustration or original portrait illustration, affordable or even cheap illustrations can be produced by a practiced illustrator using these tools. No matter what process the artist decides to adopt, fantastic results can be obtained if the illustrator has the skills and the training to optimally utilise everything at his disposal. Black and white portraits have a timeless and classic quality about them. The black and white artwork can capture the inner soul of the subject in a way that color illustrations cannot. However, many artists feel that black and whites can lend a bleak touch even to the most cheerful of themes. \in which case, a pop of color can retain the character of black and white portrait, even while cutting through the starkness of black and white. Another way to use Black And White Pop Art is to enhance a bland portrait into eye-catching illustrations. Black And White Background portraits are also an effective way to highlight and keep the focus on the subject of the portrait. In the hands of an accomplished illustrator, colorful illustrations can turn into exquisite masterpieces. While black and white portraits have their own place, unabashed use of color can be a clever way to explore the various nuances of the subject in a portrait. Color splash is extremely popular in the illustration circle for its eye-popping effects while colorful WPAP has a geometric style that produces unique results. In this particular genre, color is the key to turning basic illustrations into beautiful artwork. One of the best and most famous examples of realistic portraits is the creation of Obama portrait by the Chinese artist Yuehua He. The incredibly realistic portrait of the US president is a great example of this genre; realistic paintings which have precision and realism as their hallmark.Realistic WPAP portrait is used to present familiar and popular faces in a unique and different illustrative style. Andy Warhol was the first superstar artist and among the most successful and influential illustrators ever. He created some of the most iconic images of all times and was the founding father of an art movement that is still imitated in the illustrative circles today. His unconventional Warhol style of illustration, including Warhol Retro Background Style, is still widely used by illustrators around the world and is wildly popular among art lovers. Roy Fox Lichtenstein was a contemporary of Warhol and also a leader of a new art movement which was evolving during those times. His illustrations were inspired by comic strip and his comic book style was often a parody, a tongue-in-cheek art style that has continued to inspire artists through the years. His precise compositions, including the sketches of the superhero Aquaman, are looked upon as eternal masterpieces. In recent times, a whole slew of zombie illustrations in Lichtenstein style have been rocking the internet. While portrait illustration seems like the most straightforward of the illustration genres, the reality is much more complicated. A great portrait illustration should not only carry the likeness of the subject, it should also reveal the essence of the subject being portrayed.